Afinia Label L301 Industrial Colour Label Printer is perfect for small and growing businesses. In-house, on-demand label printing allows the flexibility that growing brands need to thrive: change your labels as-needed to accommodate branding, ingredient, or government regulation changes. Powered by time-tested HP thermal inkjet printing technology, the professional-level L301 can go to work for just about any label application. Just plug it in to your computer, install the included software, and you are ready to print labels from Windows, using your existing design software, or from a pdf. Bringing label printing in-house with the L301 Professional Label Printer allows brands the flexibility they need to grow. Instead of ordering minimum label quantities that can result in wasted or outdated labels, brands can print the labels they need, when they need them. The L301 also opens the door to seasonal product labelling, and private labelling products for customers. The industrial-quality L301 prints in vivid, optimized colour (up to 4800 x 1200 dpi), creating a professional label that catches the eye of potential customers. It’s compatible with a wide range of media, so you can create the best look and feel for your brand. Creating professional labels on demand is easy with the L301. Bringing short-run label printing in-house saves time and money. Eliminate lead times, setup fees, plate changing fees, and order quantity minimums associated with outsourcing labels. The L301’s continuous roll printing capability allows businesses to print professional-quality labels as needed. No more wasted time, wasted money, or wasted labels. 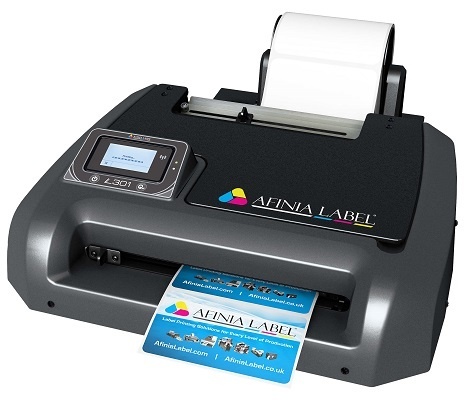 Afinia Label L301 Ink-Jet Colour Label Printer - Includes 1x CMY & 1x Black ink Cartridge and 100 sample labels. Afinia Label L301 Black Colour Ink Cartridge - BLACK Ink-Jet Cartridge for the L301 Printer. Afinia Label L301 Tri-Color Colour Ink Cartridge - Tri-Color Colour Ink Cartridge for the L301 Printer. Afinia L301 RW100 Rewinder - 152mm wide - Afinia L301 RW100 Rewinder - 152mm wide.